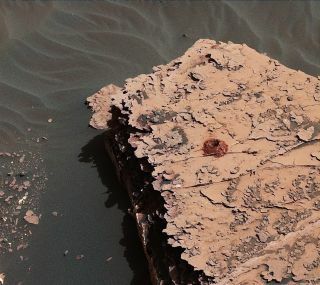 NASA's Curiosity Mars rover captured this shot of the 2-inch-deep (5 centimeters) hole it drilled in a target called "Duluth" on May 20, 2018. It was the first rock sample captured by the drill since October 2016. It looks like Curiosity's drill is finally back in action. NASA's Curiosity Mars rover bored 2 inches (5 centimeters) into a rock on Sunday (May 20), grabbing powdered Red Planet samples for the first time in more than 18 months, agency officials said. The most promising of these alternate drilling techniques keeps the drill bit extended beyond the stabilizing posts and then pushes it into the rock using force provided by the robotic arm. This method passed a multitude of tests here on Earth, and now it's aced its first bona fide run on Mars, on a rock target called "Duluth," mission team members said. "The team used tremendous ingenuity to devise a new drilling technique and implement it on another planet," Curiosity deputy project manager Steve Lee, of JPL, said in a statement. "Those are two vital inches of innovation from 60 million miles [97 million kilometers] away. We're thrilled that the result was so successful." Curiosity demonstrated the new technique in a limited fashion earlier this year, boring about 0.5 inches (1.3 cm) into a different Mars rock. But that hole wasn't deep enough to allow the rover to grab samples, NASA officials said. Drilling is a vital part of Curiosity's $2.5 billion mission, which is investigating Mars' past potential to host life and how the Red Planet's climate has changed over time. Curiosity's analyses of drilled rock samples have allowed the rover team to determine that the robot's landing site, the floor of the 96-mile-wide (154 km) Gale Crater, hosted a habitable lake-and-stream system for long stretches billions of years ago. A close-up image of the 2-inch-deep (5 centimeters) hole Curiosity produced using a new drilling technique on May 20, 2018. The hole is about 0.6 inches (1.6 cm) wide. This image, taken by Curiosity's Mast Camera, has been white-balanced and contrast-enhanced. The car-size Curiosity analyzed those samples using two high-tech mini-laboratories on its body. The rover used a specially designed instrument to transfer powder from the drill to those instruments &mdash but that instrument won't work with the drill bit permanently extended, as it is in the new technique. The mission team thinks Curiosity can sort of sprinkle collected powder from the drill bit into the analytical instruments, but that method will have to be tested and demonstrated on the Red Planet. And that's just part of the work that remains to be done, mission team members stressed. "We've been developing this new drilling technique for over a year, but our job isn't done once a sample has been collected on Mars," Tom Green, a JPL systems engineer who helped develop Curiosity's new drilling method, said in the same statement. "With each new test, we closely examine the data to look for improvements we can make and then head back to our testbed to iterate on the process." Curiosity is currently climbing up through the foothills of the 3.4-mile-high (5.5 km) Mount Sharp, which rises from Gale Crater's center. The rover is studying the rock layers as it goes, hunting for clues about Mars' long-ago transition from relatively warm and wet to cold and dry.